PVC tarpaulins are made off 100% Polyester yarn. The tarp is 610g/sq m; Each net has 25mm folded hems which are sewn with a single needle lockstitch machine. Eyelets are positioned at 1.2m intervals with a triple thickness reinforced tab. 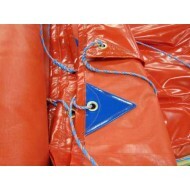 These tarpaulins are rot proof, water proof and UV resistant. They are less susceptible to damage from UV rays and can remain outside in all weathers without suffering a loss in tensile strength. Each net comes with 2m x 6mm Ties. This net is available in different colour on request. Please allow 7-10 days to order in other colours and sizes. PVC tarpaulins are made off 100% Polyester yarn. The tarp is 610g/sq m and each net has ..